SoNaRR (State of Natural Resources Report) commissioned by the Welsh Government is country-wide assessment of the health and resilience of ecosystems and the first assessment of the extent to which Wales is sustainably managing its natural resources. Environment Systems was involved both in a pilot mapping project and subsequently in creating opportunities mapping which develops the evidence for Area Statements. SoNaRR reported that the full value of natural resources and ecosystems were not fully considered in decision making and also concluded that new tools and techniques would be required to understand the value of the contribution that ecosystems make, sometimes referred to as natural capital accounting. By providing valuations of natural capital, decision makers can take better account of the environment in their plans to allocate resources, to develop and promote well being and the growth of the economy. Natural capital accounts present the value of the environment in an accounting format that is familiar to business and policy leaders enabling environmental issues to be considered alongside economic effects when gauging the feasibility of actions. Earlier this year NRW (Natural Resources Wales) commissioned a feasibility study from Vivid Economics with Environment Systems as a partner. The objective of this study was to develop strategic thinking, a framework and options for progressing natural capital approaches, especially natural capital accounting, including the identification of appropriate data sets and methods. There was a particular emphasis on understanding the requirements of users and the future uses of accounts in the context of local scale that the Area Statements work within. 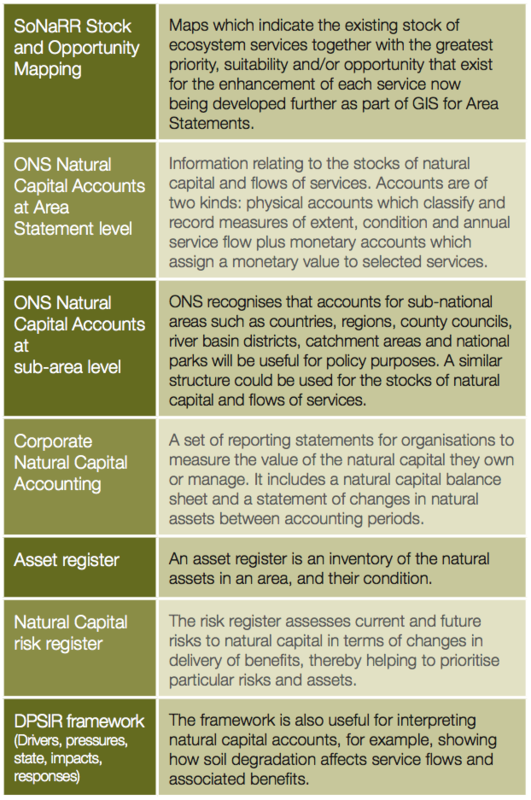 The table above summarises the features of some selected natural resource accounting tools. The tools were appraised for their potential added value beyond the features of the existing programme of NRW natural capital work, especially NRW’s SoNaRR stock and opportunity mapping. The results of the work are enabling NRW to build on natural capital approaches in its delivery of the requirements of the Environment (Wales) Act 2016, in particular Area Statements, and in its work more widely. This will enable NRW to take natural capital accounting forward in a targeted way that works best for Wales. Copyright © 2018 Environment Systems Ltd. All rights reserved.